Speak, Dog (and Other Stories) is a not-yet-completed collection of short stories set in the Darkeye universe. Speak, Dog is a novella that takes place long before the events that occur in Wild Dog City. Other short stories in the collection will take place from the perspectives of such characters as Sacha, Mini, Vimbo, and Tareq. Once upon a time there was a city with an endless supply of food, where science was celebrated and the most popular pet was a thinking, talking dog. But the image of this perfect pet is shattered when a dog kills its owner and for the first time ever, asks for a fair trial. Zeki, a teenage boy, and his dog Tesem are shocked by the news of the trial. But they have no idea what the repercussions are going to be like when a new rule of law takes over the city as people begin to fear their dogs, straining their friendship to the limit. Meanwhile, Angari, a streetwise Basenji, inadvertently stumbles onto some startling information while carrying out her own investigation of the murder: the time of limitless food is coming to an end, and the humans are discussing a new, alternative source of meat. This knowledge comes with a price- on her head. When the dark truth about the murder trial comes out, it rattles the city’s population to its core. What is the right place for animals with human intelligence in a city that can no longer support its swelling population? As Zeki, Tesem, and Angari struggle to find their own answers, a final player enters the scene: a cagebound, nameless wild dog. Read a scene from Speak, Dog. 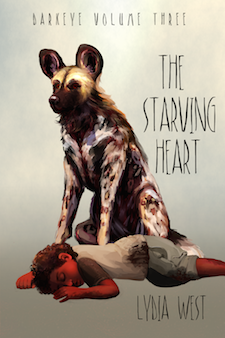 A longer preview is also bundled with the published versions of The Starving Heart. Not yet… I should probably change that whole “available in 2015” bit. Progress is slow, but I promise this novella WILL appear at some point.